Sorry, no newspapers were found for towns matching mt evelyn. 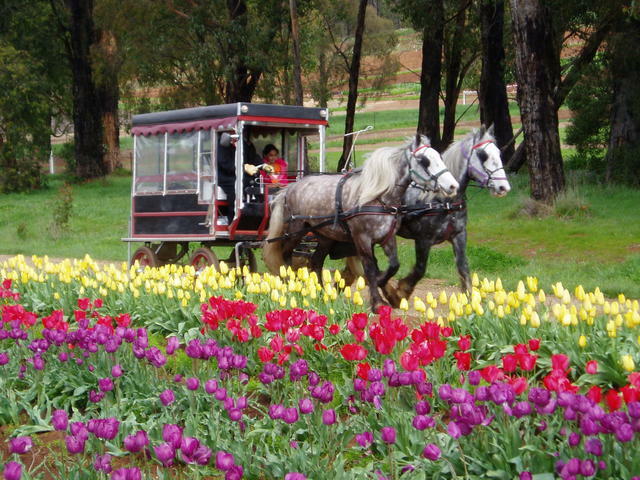 On the Mt Evelyn to Monbulk road passing nearby Silvan Dam, there is the famous Tesselaar's Tulip Farm which holds its annual show towards the end of September over a number of weeks each year when the tulips are at their finest to see. There a literally hundreds of varieties in all the colors of the rainbow to see. What better way to see it all but from the seat of a horse drawn buggy! Food and wines are on display from a variety of local producers, and plenty of entertainment for all ages to see.